WEEPING WATER – Conestoga walked off the basketball court in a sunny mood Monday night after weathering an early scoring run from Louisville. 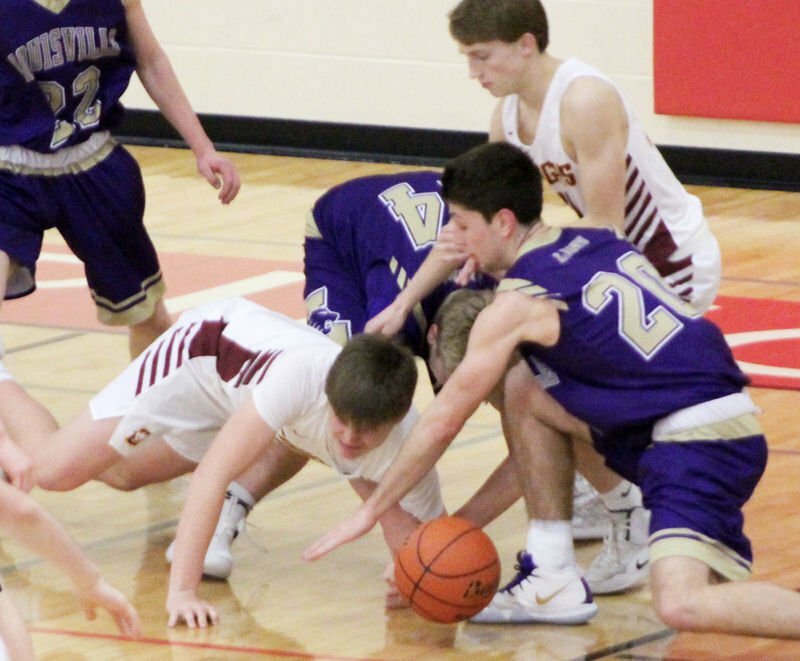 The CHS boys edged the Lions 59-53 in the Subdistrict C1-3 Tournament at Weeping Water Activities Center. Conestoga improved to 10-12 and stopped Louisville for the second time this year. The team won the season opener 54-50 in the LHS gym. Louisville began the subdistrict contest with on-target shooting. The Lions led 18-8 after one quarter and remained up 20-13 after a fast-break basket from Doug Euans. Conestoga sliced that deficit in the final stretch of the first half. Jaydon Fisher drilled consecutive 3-pointers from the corner to bring the Cougars within 20-19. Koby Vogler’s basket kept the margin at 23-21 with under a minute left. Louisville’s Caleb Hrabik created the 25-21 halftime score with a late basket. Three straight hoops from Hrabik helped Louisville remain ahead 34-31 after three quarters. Both teams then lit up the nets in the final period. Conestoga scored on 12 of its 16 trips in the fourth quarter, and Louisville posted points on nine of its 14 possessions. A stop-and-pop trey from Kobe Gansemer with 4:11 to go gave Conestoga a 42-39 lead. The team stretched it to 51-44 after Gansemer scored five straight points and Ben Welch and Jax Madsen each canned jumpers. Louisville tried to rally after Jaren Powell made a steal and layup with 13.5 seconds to play. A 3-pointer from Hrabik made it 57-53 with 3.1 seconds to go, but Conestoga preserved the victory after that. The team successfully inbounded the basketball and Welch sank the game’s final two free throws. Gansemer helped Conestoga with 19 points. Madsen poured in 16 points and Fisher and Welch each had nine points. Vogler chipped in six points and Lane Fox and Alex Lamoureux both provided defensive work. Welch and Vogler both drew one charge in the game. Brady Geise guided Louisville with 18 points, seven rebounds, one assist and one steal. Hrabik generated 19 points, one board and one steal, and Powell ended the evening with two points, six rebounds, three assists and two steals. Eric Heard took one charge and provided five rebounds and four assists. Jaden Maxey had two points and two rebounds and Euans collected four points, one board and one steal. Quinn Wolcott pitched in three points, three rebounds and two steals for the Lions. Conner Buettner produced four points, three rebounds, three assists and three steals. Talon Ball grabbed two rebounds and Tyler Mackling added one point. Louisville finished its season 7-16. Geise, Maxey, Euans, Buettner, Wolcott, Powell and Stealth Reeves were the team’s seniors. Maxey 1-2 0-0 2, Geise 6-10 3-5 18, Euans 2-5 0-0 4, Powell 1-4 0-0 2, Wolcott 1-3 1-2 3, Ball 0-0 0-0 0, Hrabik 7-9 4-4 19, Heard 0-2 0-1 0, Buettner 1-1 2-3 4, Mackling 0-0 1-2 1. Totals 19-36 11-17 53. Fox 0, Madsen 16, Welch 9, Vogler 6, Lamoureux 0, Gansemer 19, Fisher 9. 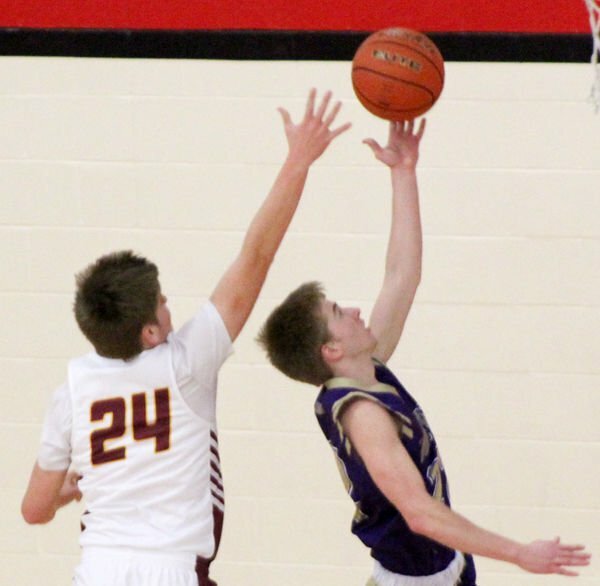 Conestoga outplayed top-seeded Ashland-Greenwood during the first half of Wednesday night’s subdistrict semifinal. The Cougars went ahead 16-12 after the first quarter and built a 32-17 halftime lead. The team knocked down several 3-pointers during the opening 16 minutes. AGHS (16-6) changed the game’s storyline in the second half. The team embarked on a 22-7 run in the third quarter to create a 39-39 ballgame. The Bluejays scored 23 points in the fourth period to advance in the tournament. Conestoga finished its campaign 10-13. Madsen, Lamoureux and Jacob Curtis were the team’s three seniors.